"Even pearls are dark before the whiteness of his teeth." 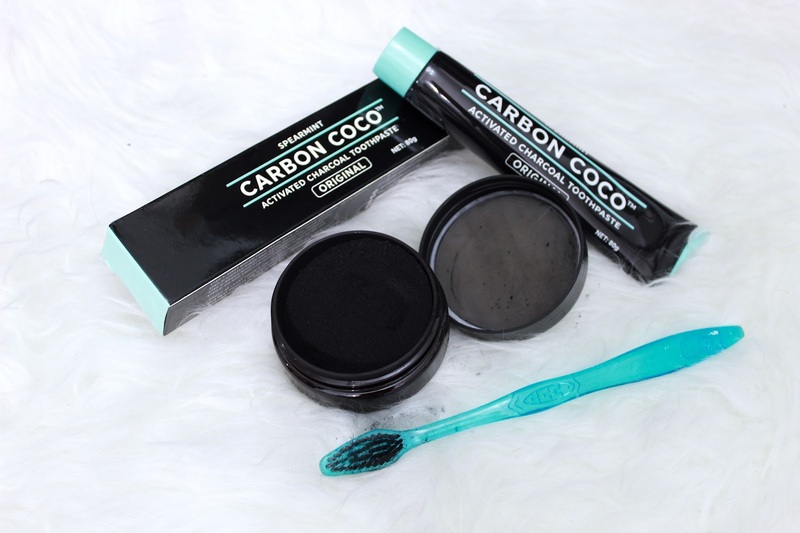 Thanks to Carbon Coco, I was able to try their amazing ultimate whitening kit! The package included a toothbrush with bamboo bristles, activated charcoal tooth polish and activated charcoal toothpaste! I think I have pretty white teeth as it is. I was addicted to whitening my teeth a few years back and since then my teeth have been pretty white! So I didn't think I needed a huge change in color for my teeth! But anything I can use to whiten my teeth, I'll definitely use! The first step to applying this product is to lightly dip the toothbrush provided into the polish. I think I added a little too much and I clearly got it all over the place! All you have to do is gently brush in circles for a few minutes and then rinse. After the polish, you add the toothpaste to the brush. It comes out as black but after a few brushes it turns into a white foam that has a spearmint taste! It was a little weird as I could feel the gritty charcoal polish. I also found it a little messy but, again, I think I just used too much polish. The toothpaste was just like regular toothpaste though! It was a little strange to brush my teeth with black toothpaste but I didn't really notice because it became just like regular toothpaste after! I didn't notice my teeth become super white after this session but I did feel like my teeth had a more shiny look to them which made them seem whiter. I don't think my photos do the product any justice. The instructions suggested using this product at night and I totally agree. I ended up having some of the polish stuck in my teeth! The instructions did say that the polish should dislodge itself overnight though! Overall, I liked the outcome. I feel like I need to use the product a little longer to see a greater outcome! It is a little weird brushing my teeth with gritty charcoal but like I said previously, I'm up for trying anything to make my teeth whiter! Disclosure: I was sent a Carbon Coco Ultimate Charcoal Kit for review, but all opinions are my own. I love this product so much <3. Thanks for sharing, I think I would be bit weirded out using charcoal as well.